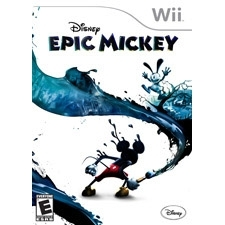 A heroic tale of redemption and discovery, Disney Epic Mickey for Wii is an adventure-platforming game with light role-playing elements, featuring an iconic and retro Mickey Mouse inspired by cartoons of the 1920s and 1930s. Pulled into a warped Disney universe called the Cartoon Wasteland by an evil villain, Mickey finds himself in a world inhabited by the retired and forgotten cartoon characters and attractions from Disney's past. Mickey must use the very elements of animation, paint and paint thinner, to explore the Cartoon Wasteland, find the source of evil that is destroying the land, and redeem his fellow cartoon characters including Oswald the Lucky Rabbit, Walt Disney's first cartoon star and Mickey's resentful half-brother. With visionary game designer Warren Spector behind the title, players choose their own path to defeat supreme evil, face the consequences of those decisions and ultimately free the Cartoon Wasteland. Use paint and paint thinner to change the world, interact with friends and enemies and solve challenges . Choose the best path to become an epic hero because "Playstyle Matters" and choices will change the outcome of the game. Explore and solve challenges in an alternate Disney world ruled by Oswald the Lucky Rabbit, Walt Disney's first cartoon star. Travel between lands in Wasteland through classic platforming levels inspired by animated films and shorts . Experience an innovative mix of platforming, action-adventure and light role playing game elements. Collect over 75 virtual Disney pins in the game by completing specific challenges, quests and discovering hidden collectibles.